I had a nice surprise this morning when the Mom and Dad bluebird showed up at the window feeder with all the kids! Man....! They look healthy! Must be that WBU mealworm diet I put them on! I had 5 birds fledge, but only see the 4 now. I'm getting ready for the second nest ..(hopefully). I have installed the camera in the top of the box and will put it online when (if) they begin to build again. I enjoy your blog. You have a lot going on in your neck of the woods! 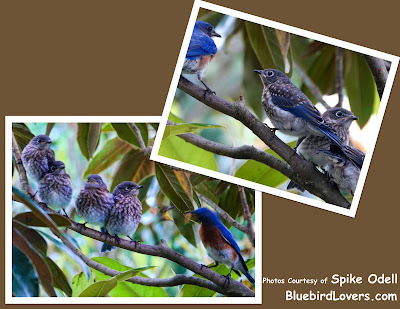 Be sure to check out Spike's website: http://www.bluebirdlovers.com. I am sure that we will be seeing some great action out of his website!